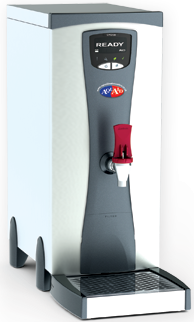 If you need to free up staff time you may want to consider the AquAid 2.1 Water Boiler. This product will produce an instant supply of hot water with out the need to constantly boil a kettle. This great looking boiler is not only stylish and compact but is also very reliable and long lasting and has the additional feature of Energy saving eco mode. The AquAid 2.1 Water Boiler also offers a minimum hourly output of 28 Litres. Electronically controlled for constant temperature of 98 Degrees.